This issue covers the period of mid-November 2016 to mid-March 2017, the second trimester of Nepali Fiscal Year 2073/74 (the Nepali months of Mangsir, Paush, Magh, and Falgun). It is based on the outcomes of NeKSAP District Food Security Net-work (DFSN) meetings held in 74 of 75 districts in March 2017. 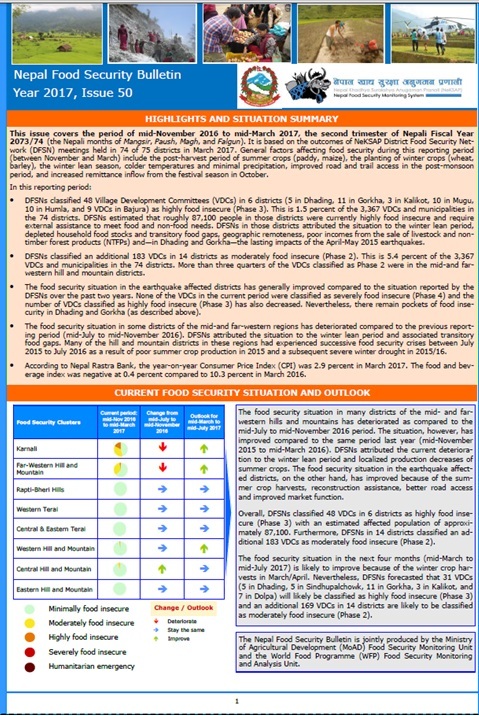 General factors affecting food security during this reporting period (between November and March) include the post-harvest period of summer crops (paddy, maize), the planting of winter crops (wheat, barley), the winter lean season, colder temperatures and minimal precipitation, improved road and trail access in the post-monsoon period, and increased remittance inflow from the festival season in October.